Job seekers wait in line to enter a job fair in San Francisco. On Friday, the Bureau of Labor Statistics will release its latest round of job figures, and there’s a good chance they’ll show that the number of long-term jobless — typically defined as those out of work for more than six months — has dropped below 3 million for the first time since 2009. That’s still double the number when the recession began in 2007, but it represents a more than 50 percent drop from 2010. Over the past two years, the decline in long-term unemployment has accounted for 70 percent of the drop in overall joblessness. That certainly sounds like good news. But as regular FiveThirtyEight readers know, the government’s definition of unemployment only includes people who are actively looking for jobs. People who give up looking for work don’t count. So, the decline in long-term unemployment on its own doesn’t tell us whether more people are finding jobs, or whether fewer people are looking. I’m on record arguing for the latter, more pessimistic interpretation. So are many others, including Princeton professor and former Obama administration economist Alan Krueger. But in research released last week, economists at the Federal Reserve took the other side of the debate, arguing that the long-term jobless are doing better than commonly believed, and that their prospects are improving along with the economy. To figure out who’s right, it helps to understand a bit about how the government collects its unemployment data. The numbers are based on the Current Population Survey, a monthly survey of about 60,000 households. Households are in the survey for four consecutive months, then out of the survey for eight months, and then back in the survey for another four months. So it’s possible to track individuals from one month to the next and see, for example, how many people who were unemployed one month were employed a month later. These “flows” paint a grim picture. The share of long-term unemployed workers finding jobs each month has barely risen since the depths of the recession, while the share dropping out has risen steadily. That suggests that the decline in long-term unemployment is being driven mostly by people dropping out of the labor force. 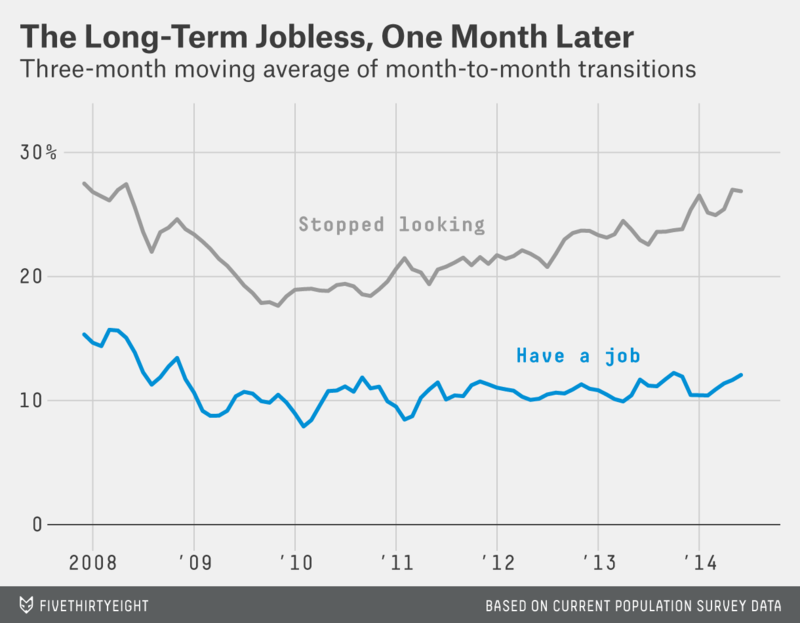 The long-term unemployed are currently more likely to transition to employment than to nonparticipation, in stark contrast with the monthly flows data. I’m not convinced by this interpretation. The chart does show that the long-term unemployed saw their chances of finding a job improve in 2010, in the aftermath of the recession, but their gains have been much more modest since then. The chart below zooms in to show their job-finding rate over the past three years. It’s hard to discern a clear pattern. There appears to be an increase over the past six months, but it’s hard to tell whether that’s a trend or just statistical noise. This debate has important policy implications, and it’s particularly significant that the researchers making this argument are at the Fed. The central bank has been gradually winding down its bond-buying program, which is meant to stimulate the economy by holding down long-term interest rates. But the bank, led by Chairwoman Janet Yellen, has pledged to keep interest rates near zero into next year, longer than some critics — including in its own ranks — would like. High levels of long-term unemployment are an important piece of Yellen’s justification for the policy: The Fed has to keep boosting the economy, she has said, to help the long-term jobless get back to work. If Cajner and Ratner are right, that suggests Yellen’s policy is working. 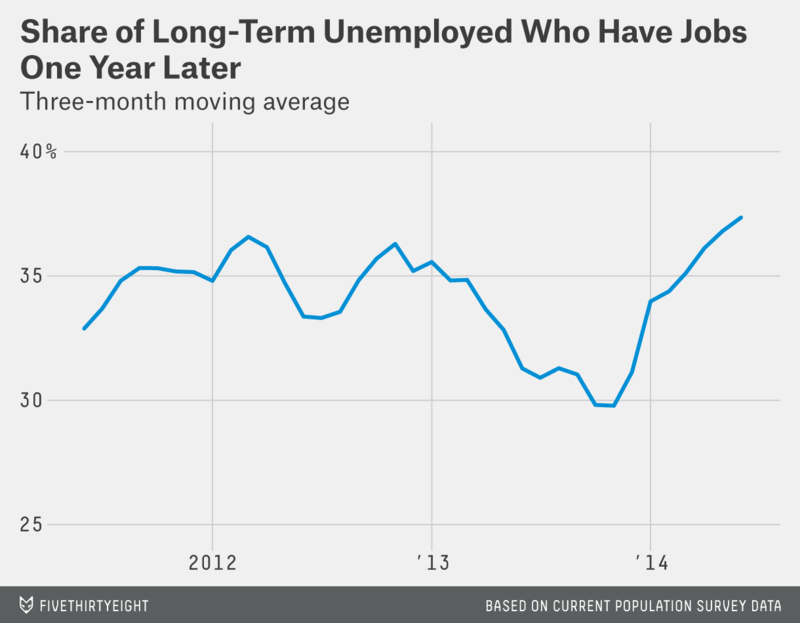 If they’re wrong, that could mean that, as Krueger has argued, the long-term unemployed are beyond the reach of traditional stimulus efforts. That wouldn’t necessarily mean we should give up on them; other, more targeted efforts such as job-search assistance might still help them get back to work. Nor would it necessarily mean that the Fed should hurry to reverse course; there are other arguments for keeping rates low at a time of anemic wage growth and moderate inflation. But it would rob Yellen of one of her most powerful arguments in favor of continued stimulus. For the record, I hope Cajner and Ratner are right. But they haven’t convinced me yet. 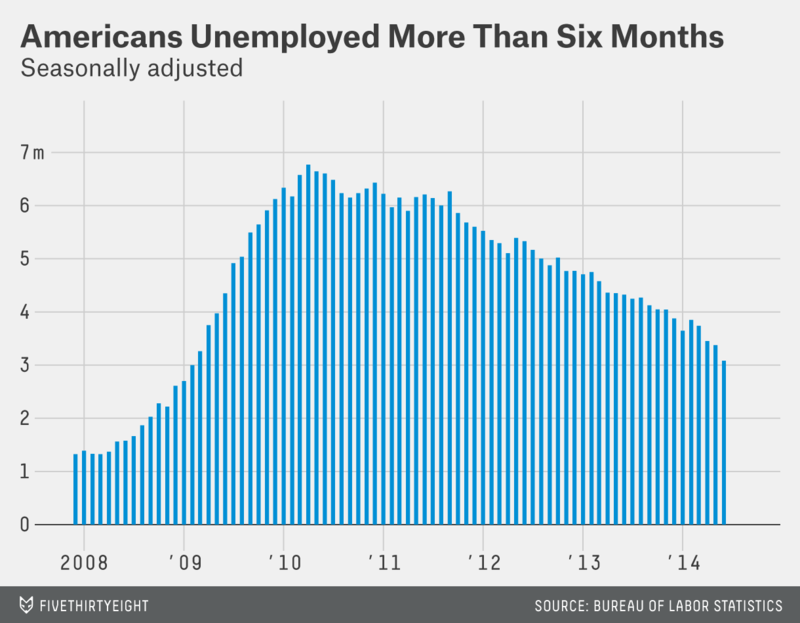 That’s partly because there are some new long-term unemployed workers each month, as short-term job seekers fail to find jobs. But that explains only a small part of the gap. 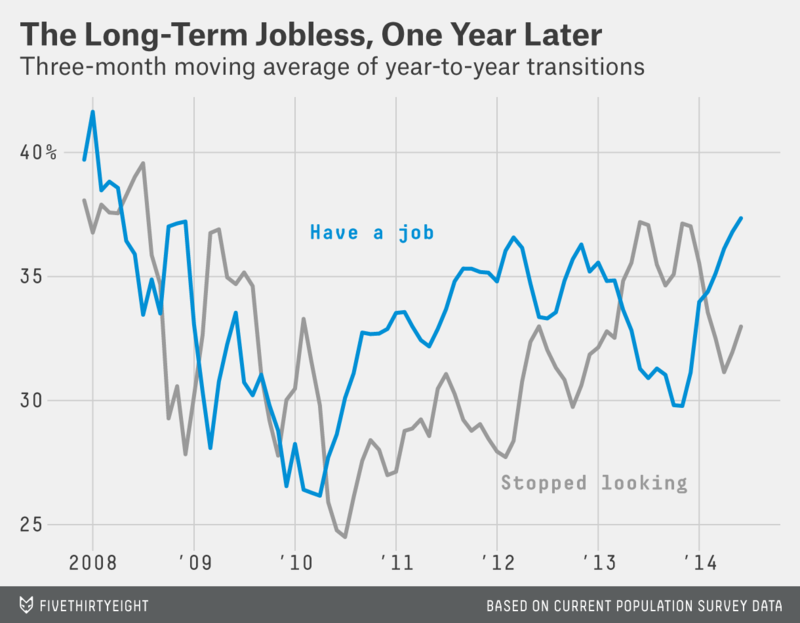 In theory, the unemployment “clock” restarts each time someone re-enters unemployment. But in practice, survey respondents report their unemployment as starting whenever they held their most recent steady job.